After a little over a decade of screenwriting a number of groundbreaking films (28 Days Later, Sunshine, Dredd), Alex Garland transitioned to the director’s chair for the first time in 2015 and delivered a masterful film he wrote called Ex Machina. This film was such a clever and thought-provoking thriller that it left me on the edge of my seat at its end with my hands cupped over my open mouth as I began to process what had just transpired. I watched it again the next day (and several times since) to look for more meanings behind the dialogue and scenes throughout the film because it was so powerful to me. 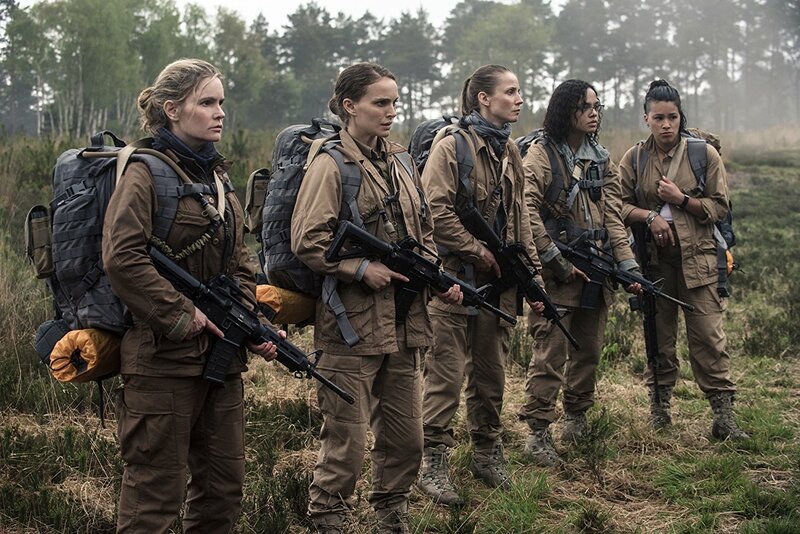 I was now doubly a fan of Garland’s work, so when it was announced he was writing and directing Annihilation, I didn’t care what it was about – I was in. 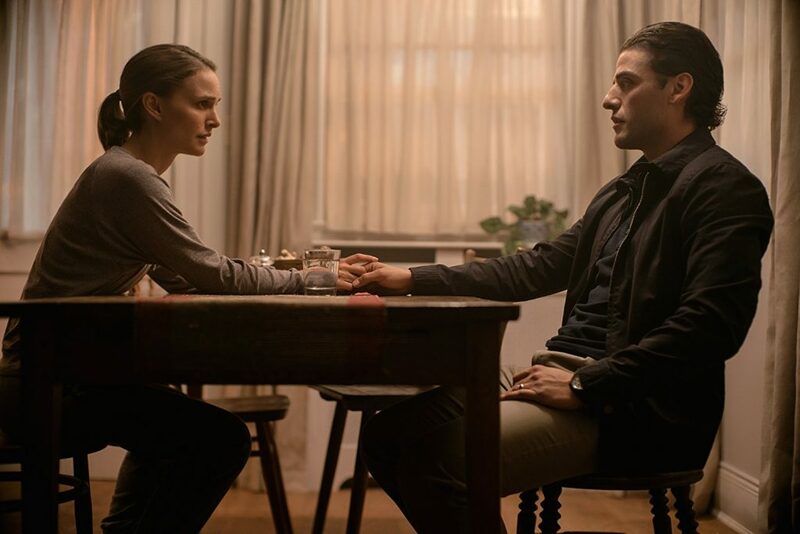 Written for the screen by Garland, Annihilation is actually an adaptation of a book of the same name by Jeff VanderMeer. The film begins with a beautiful shot of a lighthouse being stricken by something cosmic and what will begin to grow as a mysterious bubble-like zone dubbed “The Shimmer.” The military has quarantined off the area in which the Shimmer resides, and several expeditions have gone in and never returned. That is until we meet Lena (Natalie Portman) as she’s being interrogated by a team in hazmat suits about what happened within the Shimmer (or “Area X” as they officially call it). The film’s story is told primarily through flashbacks through Lena’s perspective. Lena is a former soldier and biologist who joins a group of all-female scientists for another expedition into the Shimmer after an inexplicable return of her husband (a covert-ops soldier portrayed by Oscar Isaac) after a year of no contact and is assumed dead. We learn that her husband was part of an expedition into the Shimmer and he, in fact, was the first person to return from it – but something was off about him and we find out he’s incredibly ill and possibly dying. It’s with that motivation (and some guilt-ridden memories) that Lena decides to join the team and enter the Shimmer. It’s within the Shimmer that the film becomes most fascinating to the viewer. It’s eerie but beautiful. The team becomes disoriented and memories become cloudy. Direction becomes unclear as the compass can’t find North. The team discovers plant life growing sporadically where it shouldn’t be (including the mutated antlers of some of the wildlife). Nothing makes sense, especially when they find a haunting video left behind by a previous expedition. Before the team is met with a terror in the night, an interesting conversation is held between psychologist and team leader Dr. Ventress (Jennifer Jason Leigh) and Lena in which she points out the importance of not confusing suicide with self-destruction. Not everyone commits suicide, but everybody, in some way shape or form, self-destructs at some point in their life. This turns out to be a huge theme for Annihilation and will have viewers speculating the meaning and symbolism of the film’s wild third act. In fact, it’s not until that third act that we even hear that ominous and haunting score that’s tacked on to the trailers and it’s so fitting as everything begins to fall into place. 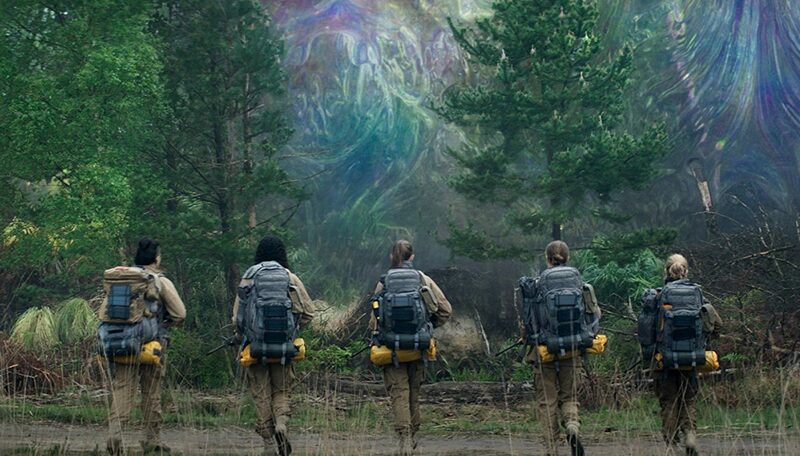 The conclusion to Annihilation is just as thought-provoking as Garland’s previous work, if not more. Before writing this review, I spent the better half of this morning dissecting pivotal moments throughout the scene with peers trying to better understand meanings and uncover things that may have been missed. Annihilation definitely leaves the viewer with questions but I believe all the evidence is there to be interpreted as Garland intends. I’ll definitely be checking this out again as soon as I possibly can and can’t recommend it enough to fellow sci-fi lovers as well.